The Smart 30 is a compact, yet powerful plastic card printer. Thanks to its ease of use and printing efficiency, it's a firm favorite in the industry. Simply put, the speed and cost-effectiveness of this printer is nothing short of brilliant! 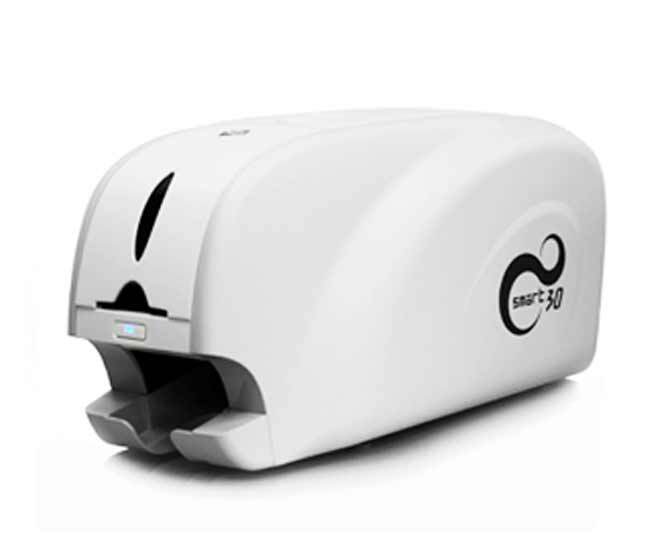 The Smart 30 is a compact, yet powerful plastic card printer. Thanks to its ease of use and printing efficiency, it’s a firm favorite in the industry. Simply put, the speed and cost-effectiveness of this printer is nothing short of brilliant! The 30D is the entry level card printer from IDP and is a perfect printer for producing high quality printed plastic cards for a variety of applications including training cards, staff ID cards, student ID cards and visitor ID cards. This particular model has a built-in card flipper which allows the user to print on both sides of the card. Furthermore, the Smart 30s can print a full-colour card in less than 30 seconds. The Smart 30D has a 100 card in out hopper and a 40 card output hopper, so simply load up your cards and let the machine do the rest of the work. Thanks to IDP’s whisper quiet technology, you can even take a nap while the printer is doing its work. Coupled with IDP’s 5-year printer manufacturer warranty on all Smart printers this gives the customer the confidence to know that all their card printing requirements will be covered for the next 5 years.